Gangster Squad is directed by Ruben Fleischer and written by Will Beal. It stars Josh Brolin, Sean Penn, Ryan Gosling, Emma Stone, Nick Nolte, Anthony Mackie, Giovanni Ribisi, Robert Patrick and Michael Pena. Music is by Steve Jablonski and cinematography by Dion Beebee. Los Angeles is being brought to its knees by crime boss Mickey Cohen (Penn). In one of the darkened offices of the police department, a special squad of officers is being assembled. 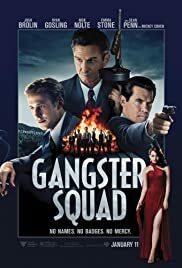 Given free licence to bring Cohen and his operations down by any means necessary, the Gangster Squad fight fir with fire. 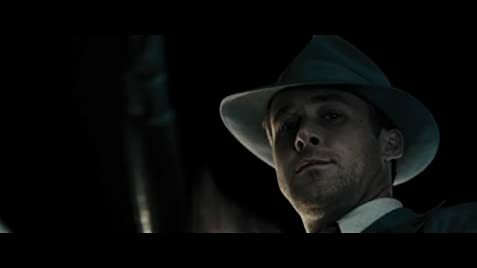 Loosely based on real life facts, Gangster Squad is a good old slice of machine gun etiquette. An all star cast get to play good guys and wise guys in The Untouchables tradition, even if that in itself can't quite lift the film to the higher echelons of gangster movies past and present. Over in the wise guys department is Penn on full tilt sweary and hammy overdrive. It's a very colourful portrayal, menacing and completely over the top. How the performance sits with you will greatly depend on how you find Penn as an actor when let loose on a cartoon characterisation. It's all very period pleasing, with a bustling late 40s L.A. hosting men with hats, trench coats and tommy-guns. Men who frequent the speakeasy bars as torch singers warble their stuff. There is nothing wrong with the production at all, except maybe when the dialogue veers to clunky. The action scenes are well crafted, loud, bloody and exciting, and the photography sparkles and the music soars.